When there’s an element of chance in a board game, whether rolling dice or dealing cards or drawing tiles from a bag, some players will be put off by it. You see them in the comments at board game websites, where someone is always praising the pure strategy of an abstract German game about running a farm for postal trains. But randomness has its place: it can alter a game in ways that force tactical shifts, preventing the same safe strategy from always being the best. Even though it’s on a computer rather than your table, Tharsis uses dice the same way. Choice Provisions’ game, which I’ve been playing an early version of, is about getting a spaceship to Mars. Nine weeks out meteors hit some of the important science bits and two crew die, then the rest have to hold the ship together for the rest of the voyage with duct tape and dreams. It’s the panicky part of FTL where fire spreads from room to room expanded into an entire game. Everything is going fine and will definitely continue to. 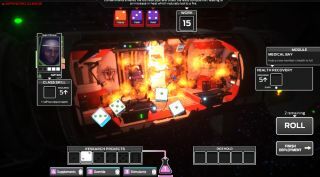 When you assign astronauts to repair damaged modules their performance is represented by dice, one for each action point they have, with three re-rolls allowed. After rolling you can spend some of those dice to reduce the number representing repair work still to be done, but any die that rolls over five can instead be spent to activate an astronaut’s special ability (the doctor’s healing, the mechanic’s hull repair), and each module has its own function that can also be activated by spending dice in various combinations (the greenhouse provides food, life support replenishes action points). Finally, at the bottom of the screen is a research bar you fill up for special bonuses by slotting in one die of each number, one through six, which can be added to from any module. Tharsis is like playing four games of Yahtzee simultaneously, only sometimes you’re on fire. Additional complications vary from room to room: in one rolling fives might reduce an astronaut’s hit points; while in another any twos will be removed from play as if they’re being voided out a tear in the hull. It gets complex quickly. You’re always being tempted to split dice over three things at once, juggling the numbers and shuffling them around before deciding how many to risk re-rolling, potentially triggering injuries or just getting even lower numbers than you did the last time. Every turn that passes without everything being repaired brings the ship’s structural collapse slightly closer. Assuming the crew survive for another turn, the second phase of Tharsis takes place. In this moment between methane leaks and meteor strikes the crew split up to suggest competing overall strategies–sacrificing some of the next turn’s action points for the sake of gaining a bonus to hull repair versus consuming more food for the sake of extra action points, for instance–and then once that decision’s been made, it’s feeding time. Everybody has unique, horrified facial expressions. Each precious lump of space food restores one astronaut’s action points, giving them more dice next turn. But food is limited, and there’s never enough–unless someone dies. When the mechanic is slow-roasted by a fire in the airlock, why not put that corpse to use? In Tharsis (at least in the current build) cannibalism is inevitable, but not without consequences. Eating each other reduces the crew’s maximum hit points and increases their stress, illustrated as they recoil in horror when you drag red lumps of people meat toward them like you’re feeding a reluctant baby with a spoon. (“Here comes the aeroplane! It used to be Jones from medbay!”) The dice gained by these acts of cannibalism turn red and splatter blood across the screen when rolled, as if stained with horror. "Here comes the aeroplane! It used to be Jones from medbay!" A thing we inevitably say about video games now is that they’re ‘harsh but fair.’ Dark Souls and Spelunky are hard as balls but play by predictable rules. When you screw up it’s entirely your own fault, but in games that involve luck it’s a different matter. Put a percentage-chance-to-hit over the head of enemies, like in XCOM or Shadowrun, and some of the fault is taken away from us. If you miss a 90% shot and fail a mission because of it you can blame the random number generator, which is clearly and obviously cheating, rather than admitting you shouldn’t have put yourself in a situation where the success of an entire mission hinges on a single shot no matter how high the percentage. In Tharsis the dice act like a cushion of blame. It’s partly my fault I put the technician with only two hit points in a room where she’d get killed if she rolled two fives, but it’s also the fault of those damn dice for rolling them. In fact it’s mainly the fault of the dice, who are jerks. A failure in Tharsis feels less dispiriting than in other games with permadeath, which is nice because I don’t always play video games so I can hate myself for not being good enough at playing video games. I can just blame the dice, especially the red ones made of people, which seem to be angry about something. It is definitely not my fault we cooked the mechanic and then carved him into haunted meat dice that never roll higher than a three. Almost definitely.